Police had to be called to Larne High School after fireworks were being set off by pupils inside the building and school grounds. One pupil was taken to hospital for an ear examination following the incident on Wednesday. He stated: “Larne High School does not and will not tolerate serious anti-social behaviour. “The school has worked closely with the PSNI to investigate yesterday’s incident and fully supports the action the PSNI have taken. A spokesperson for PSNI Larne said: “Police spent a few hours yesterday in Larne High School dealing with the aftermath of spate of fireworks being set off both on school grounds and inside the school building. The PSNI is urging parents to stress the “obvious dangers” of fireworks to their children. Police have pointed out that it is an offence to use fireworks without a licence. The spokesperson added: “Young people, be warned, if you are found with fireworks and you do not have a licence, you have committed an offence anyway. “When you throw such items at cars, buildings or people, do not expect any leniency when caught. In a social media post, one woman reported that one of the fireworks had been set off beside her daughter in a school hallway. 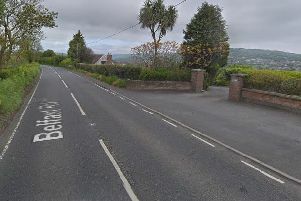 A neighbour said that she had heard fireworks at Larne High School whilst she was watching television.